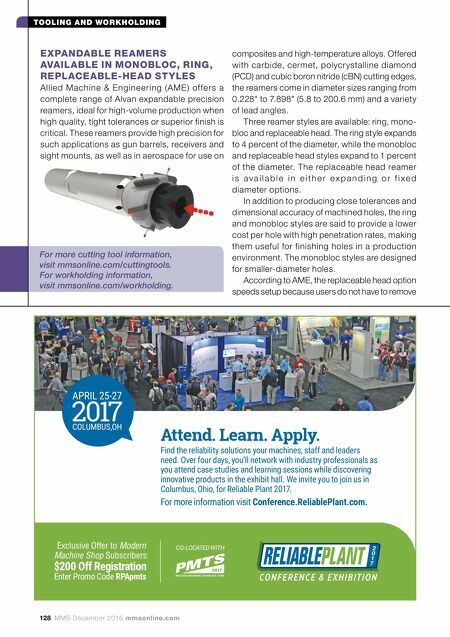 mmsonline.com December 2016 MMS 129 TOOLING AND WORKHOLDING techspex.com IN PARTNERSHIP WITH: Search Machines Smarter. Machining Center Drill/Tap Boring Mill Milling Machine Machine Type: The Machine Tool Search Engine the tool from the machine. This option is an espe- cially good choice for use with a fixed-head reamer, in which the diameter comes preset and ready for use. Allied Machine & Engineering, call 800-321-5537 or visit alliedmachine.com. 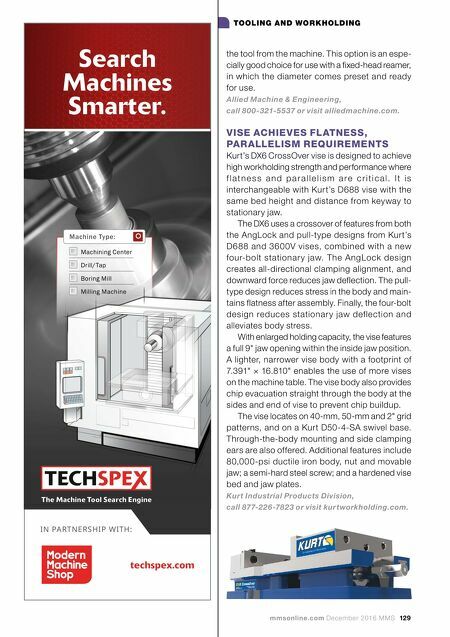 VISE ACHIEVES FLATNESS, PARALLELISM REQUIREMENTS Kurt's DX6 CrossOver vise is designed to achieve high workholding strength and performance where f l a t n e s s a n d p a r a l l e l i s m a r e c r i t i c a l . I t i s interchangeable with Kurt's D688 vise with the same bed height and distance from keyway to stationary jaw. The DX6 uses a crossover of features from both the AngLock and pull-type designs from Kurt's D688 and 3600V vises, combined with a new four-bolt stationar y jaw. The AngLock design creates all-directional clamping alignment, and downward force reduces jaw deflection. The pull- type design reduces stress in the body and main- tains flatness after assembly. Finally, the four-bolt design reduces stationar y jaw deflection and alleviates body stress. With enlarged holding capacity, the vise features a full 9" jaw opening within the inside jaw position. A lighter, narrower vise body with a footprint of 7.391" × 16.810" enables the use of more vises on the machine table. The vise body also provides chip evacuation straight through the body at the sides and end of vise to prevent chip buildup. The vise locates on 40-mm, 50-mm and 2" grid patterns, and on a Kurt D50-4-SA swivel base. Through-the-body mounting and side clamping ears are also offered. Additional features include 80,000-psi ductile iron body, nut and movable jaw; a semi-hard steel screw; and a hardened vise bed and jaw plates. Kurt Industrial Products Division, call 877-226-7823 or visit kurtworkholding.com.